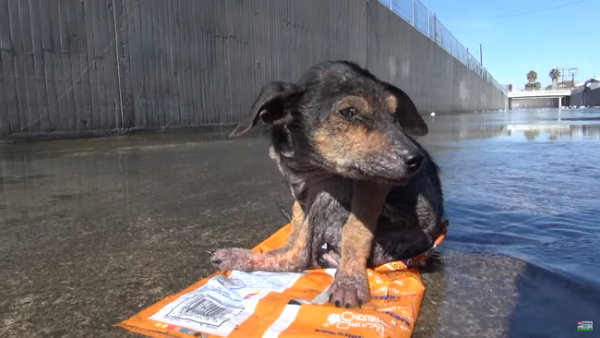 When a man found a discarded puppy severely injured and unable to move in a canal, he was horrified to discover the condition of one of its legs. But with lots of love and care, the little puppy recovered and started running again. 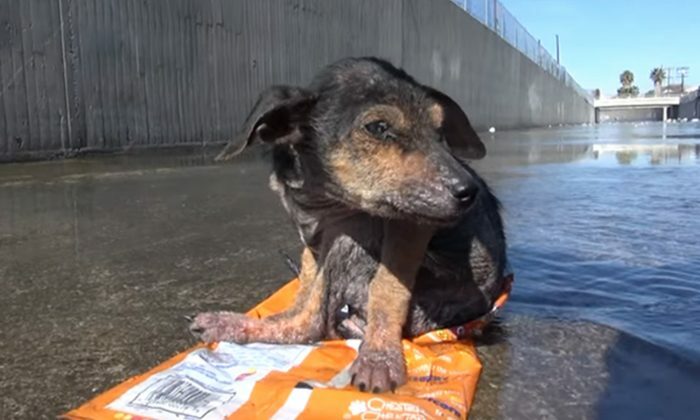 In 2015, volunteers from the charity organization L.A. on Cloud9 were in South Los Angeles distributing food to residents at a homeless encampment when they saw a puppy crying in an empty canal. Claudia Perez, the founder of the group, called animal rescue organization Hope For Paws for help, and soon, Eldad Hagar, co-founder of the organization, arrived to rescue the puppy. 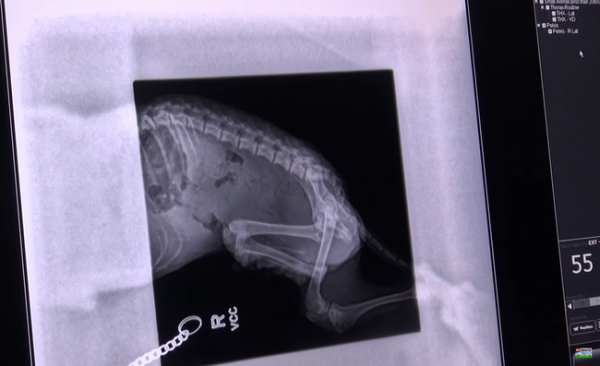 The puppy had been brutalized, thrown 30 feet, and left to die. Hagar soon realized that the puppy, which he later named Jordan, was squealing in pain because of a missing leg. “Someone literally cut off his foot,” he was heard saying in the video that recorded the rescue process. “He was just in bad shape. All bones and severe mange, and a leg was chopped off,” Perez recalled Jordan’s condition to ABC 7. 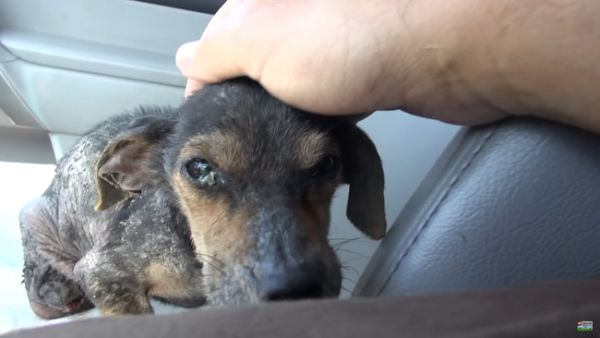 She added that witnesses had told her that a homeless man had abused the dog. “The way it was cut and choked, thinking it was dead, so they just lunged him in the riverbed, thinking that’s it,” she said. 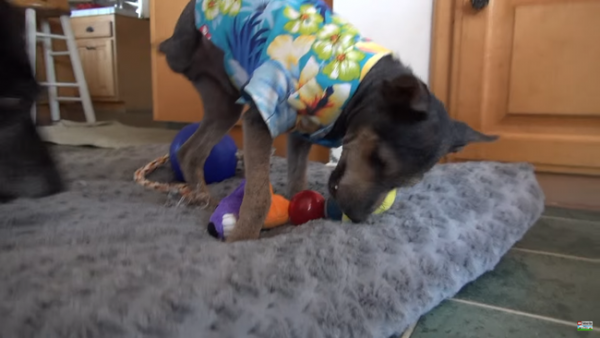 When Hagar took Jordan to the Veterinary Care Center in Hollywood, veterinarians told Hagar that it was a “miracle” that Jordan was still alive. 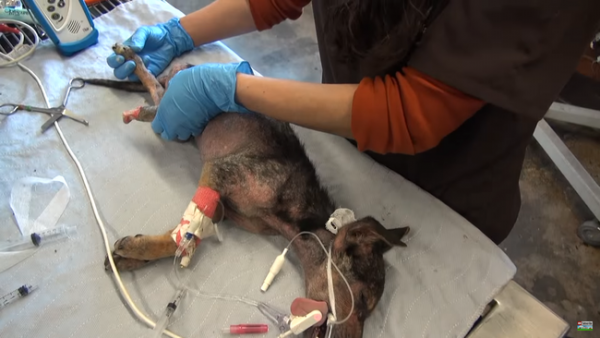 The veterinarians found that Jordan was suffering from bacterial infections, malnutrition, and mange. They gave Jordan a bath and a blood transfusion. He later underwent surgery for his severed leg after he became stronger. From the video, Jordan soon recovered and could later swim and run about with his three legs. “At the weekend, Jordan loves to go on hikes and is surprisingly good at it. There’s a creek nearby and he’ll go in the water and dive his whole face under to catch tadpoles,” his owner, Julie, said in an interview with The Pet Matchmaker. “Though Jordan lost his leg, he never lost hope,” reads a statement in the video. If you would like to learn more about Jordan’s current situation, visit his Facebook page, Jordan the Wonder Dog, for more information.